Kabul is one of the thirty-four provinces of Afghanistan. 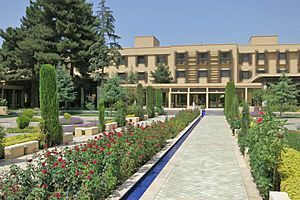 It is in the east of the country and the province capital is the capital city of Afghanistan, Kabul. Once considered one of the most educated and beautiful cities in the world (in the early 13th century) it has since been demolished in heavy wars and strong political movements and foreign powers. Kabul is situated at an elevation of about 1800m (about 5900 ft) making it one of the highest capital cities in the world. It's also one of the country's most cosmopolitan cities and is the center of foreign affairs. Most of the Kabul's economy depended on its tourists in the 60's and 70's. Kabul had textile, cotton production, and carpet production industries, but most of its economy came through tourism which it lost during its destruction. Kabul's produces include: natural gas, cotton, wool, carpets, agriculture, and some small production companies. Kabul has trade partnerships with the UK, France, Germany, USA, India, South Korea, Turkmenistan, Kenya, Russia, Pakistan, China, Iran. Kabul's economy has increased after being down for 25 years. A new currency was introduced to Afghans which helped the economy. Many American industries were interested in the new Kabul and many new companies have since then opened their branches in Kabul. The Kabul City Centre Mall was built and has nearly 100 shops. The economy is in a boom level and is increasing dramatically. Home costs are going up as well as wages of employees. The cost of living has increased dramatically which is a problem for the non-educated Afghans, who cannot support themselves. The UN also helps Afghans in need of help by providing aid, food and school materials for schools. Many international aid organizations are contributing to the Afghanistan economy. Kabul Province Facts for Kids. Kiddle Encyclopedia.